The types of metrics that successful inbound marketers leverage today go far beyond the vanity metrics of the past. Page views, social followers and email open rates do little to provide answers about the behaviors of people who actually generated all that data. Where on the page do visitors stop engaging and hit the back button? Is that pop-up helping or hurting conversion rates? The only way to get answers to these perplexing questions is to “see” everything your visitor is doing as if you were watching over their shoulder. Sound impossible? In anticipation of his presentation at Wisconsin’s premiere marketing and sales conference, Experience Inbound, we interviewed Bradley Friedman of Lucky Orange to get a glimpse of how this platform can help inbound marketers take the guesswork out of optimizing their company websites to create the best user experience possible and improve performance. Tell us a little about Lucky Orange — what is it, and how can today's B2B marketers benefit from implementing Lucky Orange on their websites to improve conversions and grow their bottom line? Lucky Orange is a secret weapon for marketers who are responsible for running websites to improve their website’s performance and how customers interact with it. As the industry’s original all-in-one website conversion optimization package, we help website owners virtually sit with their customers to watch interactions and spot opportunities to improve their customers’ experience. Lucky Orange allows you to go well beyond the limited scope of other analytics software, taking the guesswork out of conversion rates with visual, easy-to-use tools. Traditional conversion analysis can take hours — what would you say are the top 3-5 user experience (UX) metrics that matter the most to boost website conversions? While it seems like a no-brainer, you would be surprised how many “simple” tasks can make a huge impact on website conversions. A few places I suggest starting out with — without giving away too many of my secrets ahead of the conference — include keeping an eye on key conversion statistics for all traffic sources, identifying roadblocks on your forms and making sure your CTAs are clear and easy to follow. In your mind, what separates Lucky Orange from the competition? The continuous access to ALL data without having to set up experiments allows the website analyst to always have insights being fed to them through the Lucky Orange dashboard. This gives you time back in your day to focus on identifying and making changes to your site without having to babysit your account. You can make sure those insights are there when you need them. The offerings you see from some of our competitors base their analytics on a sample of visitors to your site — not the data of all visitors. For many of our customers, they aren’t comfortable making decisions about their business based on just a sampling of what’s happening with visitors on their website; they want the full picture. What's one of the biggest mistakes you see marketers making today and how would you help them solve it? Many marketers today are trying to “keep up with the Joneses.” Instead of focusing on what their website visitors are trying to accomplish, they sacrifice a good user experience by thinking they need to include all the latest technologies and bells and whistles on their site. At the end of the day, a good user experience is not always about the best-looking site but one that gets the job done best, whether it is driving a sale, lead or whatever your end goal may be. What is the #1 takeaway you hope attendees walk away with from your session at Experience Inbound? Tackling the challenge of improving website conversions can seem overwhelming, but if you have the right website analytics tools in place, improving the performance on your website no longer needs to be the project everyone is afraid to start. Marketers can feel empowered instead of feeling worried about making the wrong decision when making changes to their website. Who would benefit the most from your talk at Experience Inbound? Anyone looking to better monetize their site, whether that be through a better user experience, driving more revenue and sales, or providing their sales team with more leads, should definitely be in the audience. Have you ever been to Wisconsin? What are you looking forward to most? I have been to Wisconsin before, but never Green Bay. It has always been a dream of mine to see a game at Lambeau Field (which will remain on my bucket list), but I’m very excited to see the city and stadium even though football season will still be a few months away! 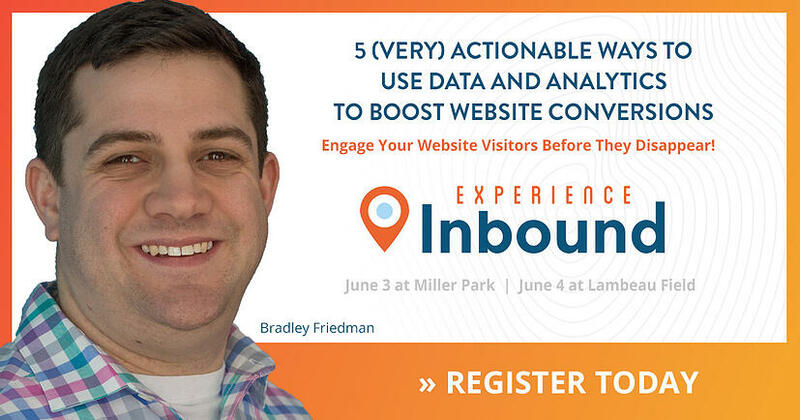 If you’re an inbound marketer who wants to bring your website user experience and lead gen results to a whole new level, you won’t want to miss Bradley’s presentation, 5 (Very) Actionable Ways to Use Data and Analytics to Boost Website Conversions. He’ll be sharing it at Experience Inbound 2019, June 3 at Miller Park in Milwaukee and June 4 at Lambeau Field in Green Bay, Wisconsin. To learn more and to register, click the link below. Stephen is an Inbound Marketing Specialist who has experience in both commercial construction and industrial manufacturing. 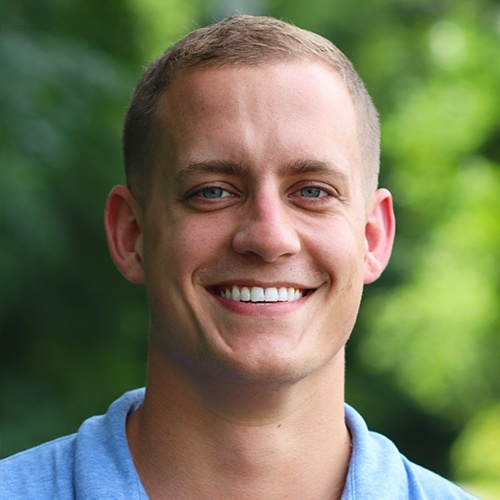 He has served as digital marketing specialist for three separate businesses and has been a hands-on army of one, so he's no stranger to jumping in and figuring things out.